My old friend Rune Christensen asked me to write the script for his animation short “Down the Road”. 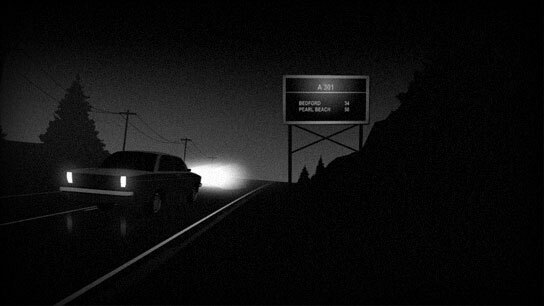 The premise was to make a cartoon thriller, in black and white, with a minimum of effects. In reality, this could have been filmed with just two people in a car, and be finished in less than half the time. But there was something compelling about making a cartoon, well, scary. Rune owns the Aarhus based animation studio JA FILM (besides being a somewhat reluctant rockstar, but that’s a different story entirely) and wanted to do something of his own, besides doing commercial work. Him and JA FILM co-owner Anders Berthelsen had a basic idea and approached me for the script. We met in Aarhus, had dinner and a lot of beers and threw ideas around and I went back to Copenhagen with a hangover and a job to do. I think I did a total of 5 drafts, where I liked the fourth one best. It differs from the finished film in many ways, but is probably less subtle than Anders and Runes final take. Or maybe it’s the other way around. I can no longer tell who came up with what, but I think most of the dialogue came from me. I remember being surprised at the premiere, that they had changed so much in the script, but the film was always theirs, not mine. I guess I just got attached to the characters. All in all it was a great learning experience for me and I really like the final film. They stayed true to the premise and “Down the Road” gained numerous awards, including Best Short Film at CICDAF, Beijing (2008) and Best Animation Short at Euganea Film Festival, Italy (2009). You can watch the finished film at indieflix.com and learn more at downtheroad.dk .